Due to advances in gadgets and technologies, it is becoming common to have a separate room solely for entertainment or for gaming. Not only for the kids and teens to enjoy but also for us adults. We make use of the gaming room as a bonding area for family and friends. So we need to take a serious effort on making the room pleasing aesthetically and interesting to hang out with people you love. 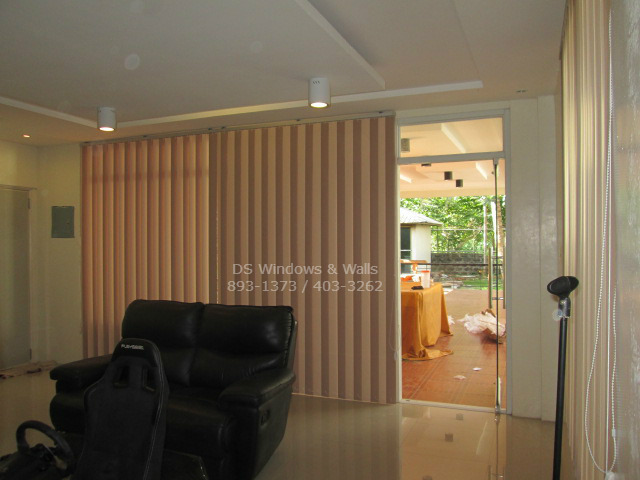 For this featured client, the PVC Vertical Blinds matches their style and personality in terms of expressing their desired color since vertical blinds has a wide range of colors compared to other blinds. It also complimented their accent wall i.e. brick-styled-wall. 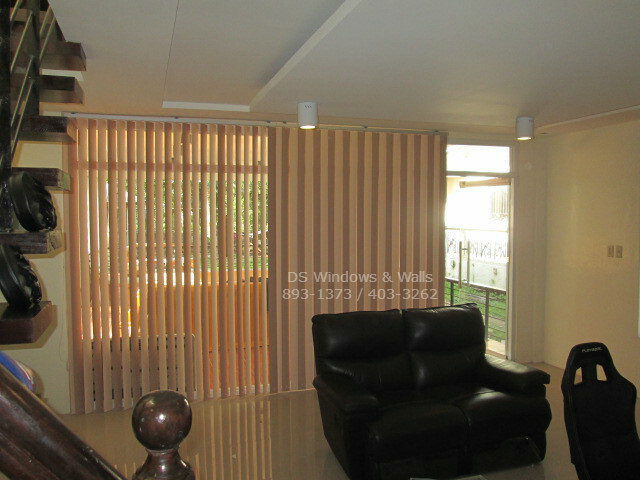 This type of blinds is also available with different color and you can also combine two or more colors in one panel. As you can see in pictures our client choose ones with earth color combination to match well with the brownish tone brick accent wall. PVC vertical blinds, although a bit cheaper than the fabric-type blinds, is made up of high-quality materials. It is made of PVC which is the poly-vinyl chloride that has excellent quality that matches a tropical country like ours. PVC, even when exposed directly to the sun doesn’t release any harmful toxic gasses compared to the low quality plastic blinds. 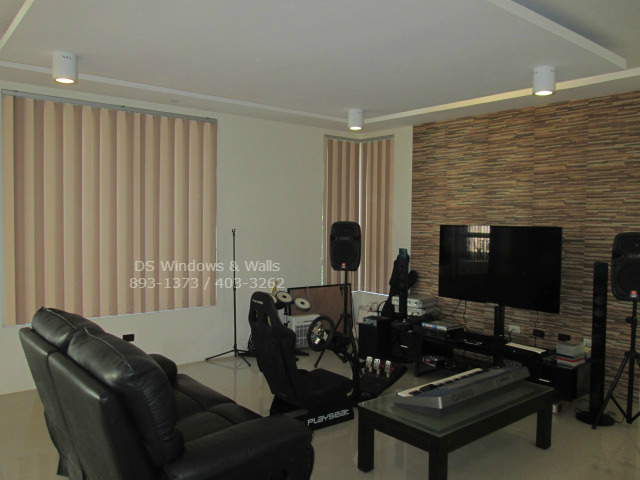 The PVC vertical blinds also provide you with a great dimming effect against the sun in the room to avoid the annoying sun glare while playing your game console or computer in your LCD/LED television and other gadgets for a more comfortable gaming experience. This is also true when watching your favorite TV shows or movies, the dimmer the room the better and that it has one of the best dimming effect compared to other blinds. Lastly, the vertical blinds protects your expensive gadgets and investment from direct sunlight that will sometimes cause overheating that ultimately damage equipment and gadgets of the room.